In October 2009, the production model of Spark changed, moving from a stand alone series of original programs to the production of Spark segments, which will be premiered throughout the year as part of the television show, This Week in Northern California. In this segment, Spark catches up with Pixar animator Sanjay Patel on the occasion of the Oakland Museum of California exhibit Pixar: 25 Years of Animation, which runs from July 31, 2010 to January 9, 2011. 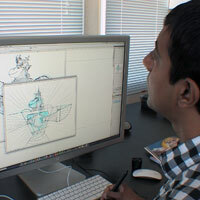 Patel, who has worked on such Pixar films as The Incredibles, Ratatouille, and Toy Story 3, draws on his Indian heritage to create a uniquely personal body of work — illustrated adaptations of ancient Hindu epics. Catch up with Sanjay Patel, who has worked as an animator on such Pixar films as The Incredibles, Ratatouille and Toy Story 3.